A life-sized pig sculpture worth £750 has been stolen from Bath city centre. 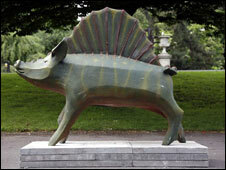 The pig sculpture, called Dinopig, was discovered missing on 2 August from near Victoria Park. The sculpture was part of a public art project which tells the 3,000-year-old legend of how King Bladud founded Bath, while walking with his swine. Gitte Dawson, organiser of the King Bladud's event, said the Dinopig was turned on to its side and unbolted from its plinth. Ms Dawson said the pig was stolen so effectively that it was a "pre-meditated theft rather than vandalism or a prank". The Dinopig is one of 100 sculptured pigs located around Bath, on exhibit until the end of August 2008. Each pig has its own individual markings and designs. The Dinopig is the second pig to be stolen in the last four weeks.